Skyfall the new James Bond employs philosophy’s Trolley Problem as a a basic plot device. This use of a famous problem in logic to fuel the narrative, is in itself an innovation in the annals of chase movies. But there other innovations in Skyfall, not the least of which being the force of evil, Silva (Javier Bardem), whose ideology has taken on a decidedly personal tone. Gone are the cold war and even the villains representing rogue international consortiums. Bardem is literally the guy next door, a former agent whose has turned against his boss, M (Judi Dench) in a big way. Which brings us back to the Trolley problem. An out of control trolley can either kill one person or a multiple of people. Naturally, the decision is to turn it towards the one. M does it to Bond (Daniel Craig) early in the movie and she had done it to Bardem, years before and thus the grudge. Other leitmotifs include entrapment and escape and old versus new. M represents the old order of things which must be replaced, perhaps along with Bond who is urged to retire by Gareth Mallory (Ralph Fiennes), the superior that both he and M report to. But there is some degree of ambiguity in the old versus new sweepstakes. The new is plainly inevitable, but is it always desirable or necessarily effective? 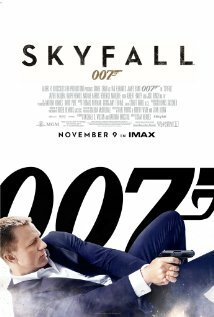 Skyfall is the name of the ancient Scottish manner on which the James Bond character was born and it is in this setting that he is finally able to engineer the victory that brings about the film’s quasi-happy ending. Ironically, with all the examples of newness on display (for instance the video game graphics operated by a youthful Q, who is a computer geek), the latest addition to the Bond cycle lacks the kind of invention to be found in say a 60’s movie like From Russia With Love with its evil rivals, SPECTRE and SMERSH and its Colonel Rosa Klebb (Lotte Lenya) who has a poison spike that pops out of her shoe. Then, of course, there’s the magnificent Oddjob (Harold Sakata) of Goldfinger. The modern and post-modernist touches and the creation of an action film that flirts with interiority might be explained by the fact that Skyfall was directed by Sam Mendes, best known to film goers for American Beauty.